On a beautiful autumnal evening I came across the artist Iñigo Manglano-Ovalle attaching a generator to his work only a few minutes before its official launch. Weather station (after Beckett) by Manglano-Ovalle is one of three National Sculpture Factory (NSF) temporary commissions that currently inhabit Cork’s Docklands area. Floating high above Weather station are a number of what might be red weather balloons on top of buildings. This work, titled Balloon , is by local artists Sorcha O’Brien and Eli Caamaño and is intrinsically linked to Weather station (after Beckett) . Both works were commissioned by the NSF to specifically respond to the site of Cork Docklands. As well as the site, there are also several formal cross-references between the works. The actual weather station - Manglano-Ovalle’s piece - has ‘Calder like’ shapes, one of which looks like a flat balloon, whilst the pristine white sea-container housing it is placed at an angle that crosses the edge of the dock. 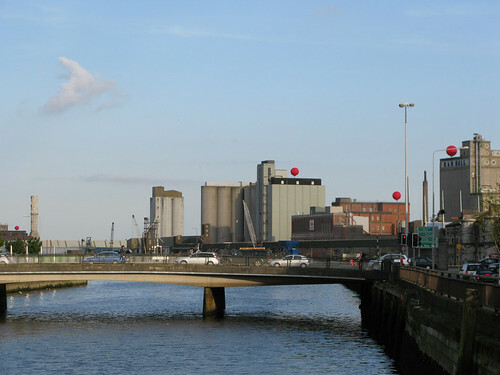 Equally, the red balloons are attached precariously to the tops of the buildings, giving both works a sense of uneasy displacement as the buildings and the dock act as oversized ‘plinths’. The weather station is enclosed in its white cube at either end by a red transparent perspex that, when lit, forms glowing red rectangles making a LeWitt(y) reference to Malevich’s suprematist paintings that then nod affectionately to the red dots in the sky. Balloon subconsciously  references Paul Klee and his painting The Red balloon  held in the Guggenheim collection. These could also be ‘thought’ balloons on Jeff Koons  or even on Not KOONS, red balloon, art object escapes from pedestal ,  an anonymous work on Youtube. The two commissions converse with a broader art history as well as to each other and they are not discussing the weather. Of all things, the discourse in the Docks seems to be ‘Modernism’. The NSF seminar ‘The Expectation of Spectacle in Public Art’ was linked to these commissions and a chance to meet the artists. During this seminar, Manglano-Ovalle informed us that the generator was to be disconnected, meaning no more red light at night. I am thankful to be one of the very few who viewed the work with the lights on as I headed home the previous evening. It looked beautiful, even dangerously seductive, glowing on the darkened Docks where I understand women of the night formerly congregated before the area was ‘cleaned up’ in readiness for future gentrification. I am unsure whether the generator being disconnected was an ecological or an aesthetic decision, but this is not the only change that has occurred during the realization of this work and it is interesting to chart the changes through the NSF announcements. “…we are specifically choosing the international artist as an outsider that can bring a fresh perspective and introduce new practice to Cork…”  This new perspective promised something very different back in the spring sunshine of April, when light and weather intertwined. Reducing complex natural systems down to pure data and then reconfiguring it into an aesthetic light experience would have communicated with another Cork artwork, made by Harry Moore. Moore’s light piece uses the tidal movements of the River Lee to influence the movement of his circular blue lights outside the Backwater Artists’ Studios. Unfortunately, Manglano-Ovalle’sweather station was never connected to the red light, and he has now switched it off altogether. Like the red balloons, the white container was also to be elevated, for the artist “…proposed to suspend a sea container between land and water in the docklands, so that it is neither arriving or leaving, echoing the ‘state of suspension’ of the docks itself.”  Unfortunately, health-and-safety combined with insurance issues suspended the proposal and not the container. Manglano-Ovalle is a very successful artist, with work in the Guggenheim and a well-publicised piece in last year’s Documenta  as well as winning awards including a MacArthur Fellowship  worth $500,000. MacArthur Fellows are nominated and judged anonymously and it is “sometimes nicknamed the ‘genius grant’.”  He is an intellectual thinker. Hearing him answer questions was like watching somebody think up a 1,500 word essay instantaneously. He also lives in America and I notice his language was peppered with military references like tactical , simulacra , strategic , multiple delivery systems , and that his use of colours such as amber and red echoes the terrorist alerts seen on American TV. Even in his interviews he can sound like an observer camouflaging himself. “All my work, even the most formal work, has an underlying politics to it. But I don’t want to reveal my position.”  Is his work then a subversive covert piece from the land of the free? Or has he, like the proverbial frog, been boiled by his immersion in a saturated militaristic America where you are either for or against the military actions! This raises the questions: is a weather station dysfunctional simply because it has not been turned on or set up to translate and communicate the received data? Or is it simply inert and mute? And why isn’t it “practically feasible” to be fully functional? Is it a lack of resources? Time constraints? Choice? From my questioning, some readers might gain the impression that I do not like this work. This would not necessarily be correct. I find Manglano-Ovalle’s work intriguing. His piece in Documenta  was a simulacrum of a mobile chemical laboratory playing peek-a-boo. It intertwined playfulness with sinister stealth in an unexpected way that might be read as a criticism of America’s actions in Iraq or simply an arty game of hide-and-seek; the actual political position, like the truck, is concealed. However, whilst I find this interesting and engaging, I am left unsure about Weather station (after Beckett) . I have unresolved questions. Artists make changes all the time and normally one would not be critical of any artist whose work progresses through creative evolution. Changes are necessary for all sorts of reasons and can even accommodate unexpected ones, with the obvious example being the breaking of Duchamp’s Large glass . However, the divergence from the original proposal, the small amount of time the artist physically engaged with the site, and the fact the ‘site’ was considered by the commissioning body to be critical to the commission, become important issues when critiquing this work. Isn’t the weather grand? Michael nods in agreement. Michael and Dolly (the horse) form the fulcrum around artist Séamus Nolan’s work Dock tour . This is the third and final commission, which is also weather-dependent to some extent. It is also the highlight of the three commissions and this is why. Taking money from the public purse, Nolan has invested it back into a man and a horse whose job is to tell stories whilst taking guests on a journey. It is terribly old-fashioned and it makes no demands on the viewer. It simply gives you something if you choose to take it. During the seminar, Manglano-Ovalle described this work as a “gift” and no word could illustrate it better. Nolan spoke in a way that reminded me of Chauncey ‘Chance’ Gardiner in the film Being there . The late Peter Sellers played Chauncey and in the film often spoke of the four seasons, slowly, quietly and in a way that meant he could be talking about something completely unrelated to climate. The listener then overlaid his or her own meaning onto what Chauncey was talking about. Nolan and his work have a similar presence. As Michael and Dolly take visitors on free tours of the Docklands in the open buggy, Michael regales you with stories related to the history of the Docks, starting from how he ate his lunch with his father over there, to the “slave” conditions the dockers were subjected too. Nolan seems to have affinity with this type of history, because in his notes he relates the story of how, back in April this year, a ship named The Defender berthed in Cork and “the dockers refused to unload the ship or allow it to cast off until the workers on board had been paid their well overdue wages.”  Nolan tells us that, “My work is concerned with power relations, energy and possibility, and I am interested in reconfiguring the everyday as a means to examine or question the purveyors of meaning.”  Nolan is not talking about the weather here, he’s endeavouring to change something, but is anybody listening? John Kelly ( www.johnkelly.eu ) is a Cork-based artist who did not enter the ‘Open’; the Open letter can be viewed here . The artists informed me they were unaware of this painting. Jeff Koons has made large sculptures based on balloons. This quote is taken from an information sheet on the artists put out by the NSF. It was later modified to reflect the changes in the work. This quote was also taken from an information sheet put out by the NSF. Like the earlier quote it was also later modified. Cork Harbour has a weather station at Roches Point. The artist was also present in Cork to give a NSF lecture in April 2008. NSF newsletter Issue 23, September 2008.